68 HP KUBOTA 3.3L FOUR CYLINDER WATER COOLED DIESEL ENGINE. 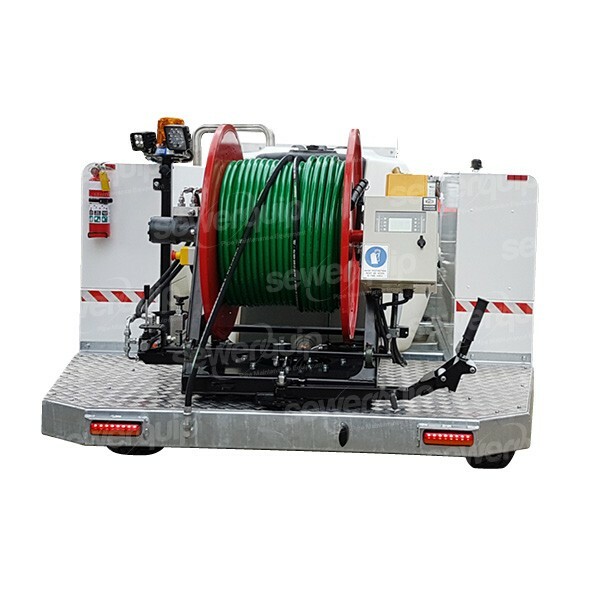 HEAVY DUTY DIRECT DRIVE HYDRAULIC POWERED STEEL HOSE REEL WITH 180° PIVOTING AND MULTI POINT LOCKING. HYDRAULIC LEAVER CONTROLS ON BOTH SIDES OF THE REEL. HOSE REEL SPEED AND TORQUE CONTROL. REEL IN, REEL OUT AND FREE SPOOL. TELESCOPIC HOSE LAYERING ARM SYSTEM. HEAVY DUTY SINGLE AXLE TRAILER, FABRICATED FROM RHS AND HOT DIP GALVANIZED, COMPLETE WITH LED LIGHTING AND READY FOR REGO. TRAILER FITTED WITH 12” ELECTRIC BRAKES AND BREAK AWAY UNIT. TRAILER FITTED WITH LT245/75R16 TYRES, STEEL RIMS, SPARE TYRE, ELECTRIC BRAKES WITH BREAK AWAY SYSTEM, PARK BRAKE AND JOCKEY WHEEL. REAR REEL MOUNTED ENGINE CONTROL PANEL WITH ENGINE PROTECTIONS. 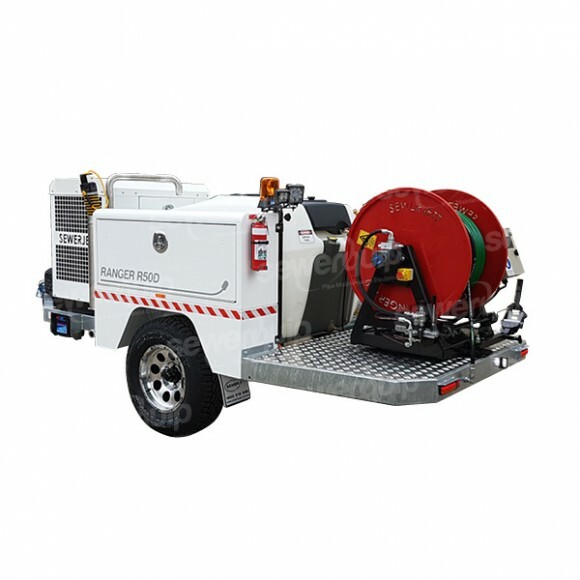 The RANGER R50D Trailer jetter is designed & manufactured in Australia to suite Australian conditions. 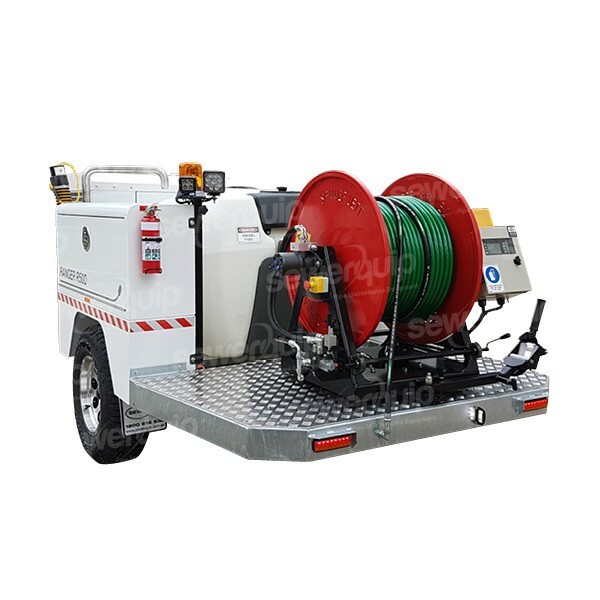 These units are designed primarily for water authorities & councils, to clear sewer & storm water lines up to 600mm in diameter and can easily be towed by a 4x4 ute or small truck. These units come with a range of performances available from 75 - 125 L/min and 2300-4000 PSI and are driven by a reliable KUBOTA 3.3L four cylinder engine. Industrial Kubota water cooled diesel engine offers superior reliability and long service life. Industrial UDOR triplex ceramic triplex piston run dry protected pump for trouble free long service life. Made in Italy. 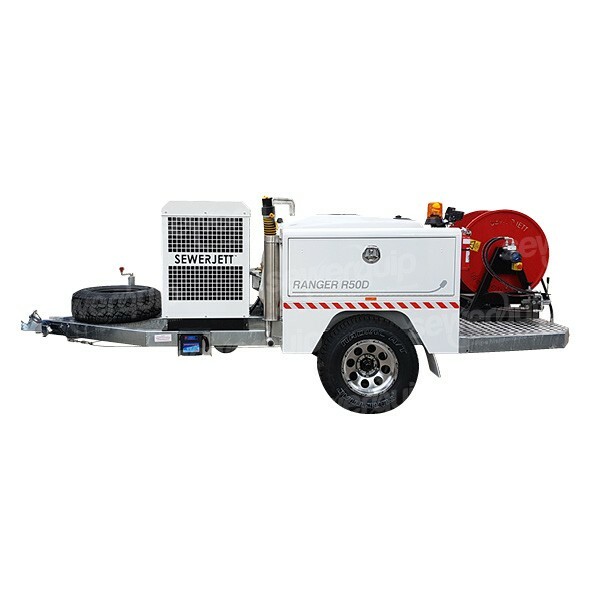 Impressive performance, Ideal for Industrial/council and commercial plumbing use, able to run large hydraulic root saws & chain flail nozzles. Engine enclosed in a weather proof cover with service access panels. Single side servicing. H/D 125 x 75mm box section single axle trailer is compact and Easy to tow and handle. Trailer chassis is hot dip galvanized for superior resistance to stone chips and corrosion. 5 year structural warranty on Trailer chassis. Heavy Duty 3180 Kg SILENT_RIDE suspension axle designed to cope with rough roads and off-road applications often encountered by regional councils. Fitted with 12” Electric brakes. Large 1135L poly rotational moulded water tank with anti-siphon fill pipe. 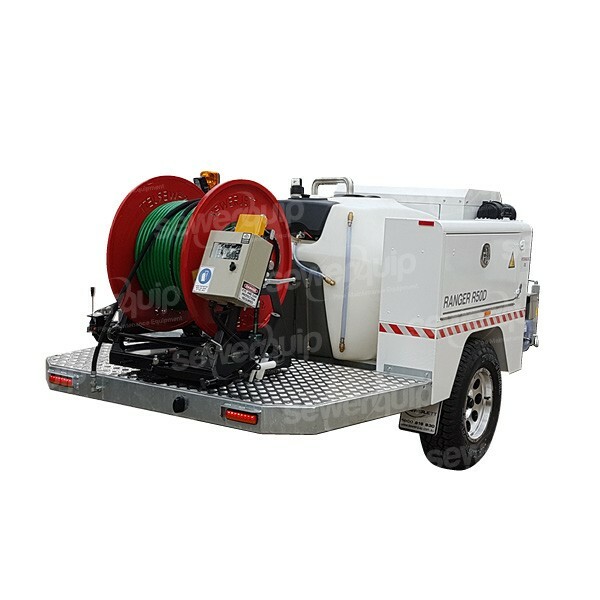 Direct drive Hydraulic powered hose reel with 180° swivel base and locking system and speed control. 2 x large TIG welded aluminium tool boxes powder coated. Large 70L fuel tank for long operation. 24 Month warranty/service backup Australia wide, for peace of mind. 100% Designed and Manufactured in Australia to suite Australian conditions.